U.S. Coast Guard 17th District Alaska Dec 6, 2018. 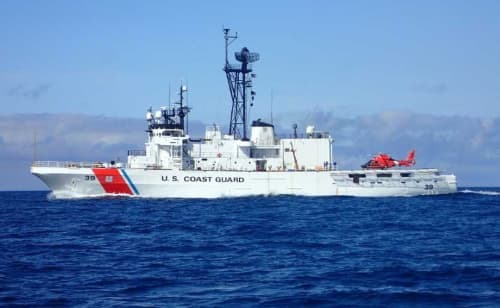 JUNEAU, Alaska — The Coast Guard Cutter Alex Haley returned to homeport in Kodiak, Alaska, Thursday, following a 66-day multi-mission patrol. The Alex Haley spent the last two months patrolling the Bering Sea and the Aleutian chain. The crew conducted boarding evolutions on the Alaskan crabbing and fishing fleet, and responded to four separate search and rescue cases. During the Alex Haley’s patrol they conducted 25 fisheries boarding evolutions ensuring the safety of the crews, vessels, and the protection of the Bering Sea living-marine resources. The Alex Haley is a 282-foot Medium Endurance Cutter with 100 personnel assigned aboard it. The cutter steamed more than 8,735 miles throughout the last two months, traveling as far west as Adak along the Aleutian chain and as far north as St. Lawrence Island. The crew’s time underway was in support of those who make their livelihood on the Bering Sea. The return to their homeport of Kodiak, Alaska, provides the cutter’s crew to be with their families and friends for the holiday season.